Acipenser, a genus of sturgeon, are magical creatures. Long-lived, slow growing and ancient, these great fishes have suffered assault from humans across Canada. Development of ravines degraded water quality while channelization, dredging and damming contributed to loss of habitat and spawning site. 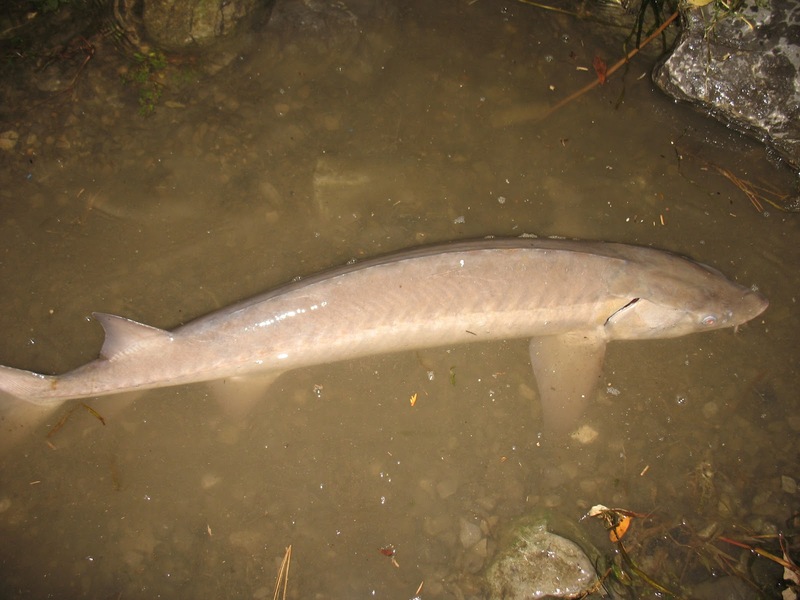 In Ontario, the once plentiful Lake Sturgeon (Acipenser fulvescens) had suffered a dramatic and rapid decline due to overfishing. Only in Northern Ontario do pockets of Lake Sturgeon continued to survive in sustainable (and even overpopulated) numbers. Southern Ontario Lake Sturgeon are rare if not of mythical status. Here and there, reports of the odd sturgeon were caught at the Lower Niagara River, the French River, Lake Nipissing, Ottawa River and the St. Lawrence River. The simple fact that these wonderful gentle giants are so rare had us jaw dropped for what had unfolded over the weekend. In the spring, I visited my friend Eli as he helped me accomplished my first Greater Redhorse. He had mentioned, under a quiet breath, that he knows of a fall opportunity for constant channel catfish with a possibly of a special whiskered bycatch. He suggested a visit in mid-October to “try” for my first Lake Sturgeon. We treated these animals with utmost respect by gentle handling, short photography session and an unrushed, careful release. We used heavy gear to bring these fish quickly to hand such that they are in prime condition for release. We kept the fish in the water at all times possible except for a quick lift for a picture. In all cases the sturgeon swam away strong as soon as we put the back into the river. My recent fishing protégé, Michael, had been quietly expanding his own lifelist. Looking for someone to share the adventure (and costs LOL), I invited Michael on this quest for the mystical creature. There were also additional target species that Michael could benefit on this trip, including walleye, sauger and redhorse species. What unfolded was nothing short of amazing. On Friday, we left Toronto for the land unknown. After a very long drive, we finally arrived at our promise land. The weather was threatening with strong wind and heavy rain. The wind reminded gusty and the rain came down steadily. Adorned in rain gear, we struggled to fight the wind and driving rain to set up camp. In anticipation for a long night of tough fishing, gear and food were well prepared, if not over prepared. We finished set up by late afternoon. Perhaps the Fish Gods were favouring our quest as the rain stopped not long after we began fishing. The water level had risen a bit and the current was rather strong. Our terminal tackle choice also had to consider the amount of sticks, leaves and grass that drift down this ever-moving conveyor belt of water as it flow southeastward toward the Atlantic Ocean. We were using heavy freshwater rods, large baitrunner spinning reel or conventional reel with a clicker, and heavy mono or braid line. Although Michael and Eli used 2oz sinkers, I preferred a 3oz bank sinker to anchor the line on the muddy and sandy bottom. Even so, a clump of eel grass often entangled the line and dragged the rig downstream. 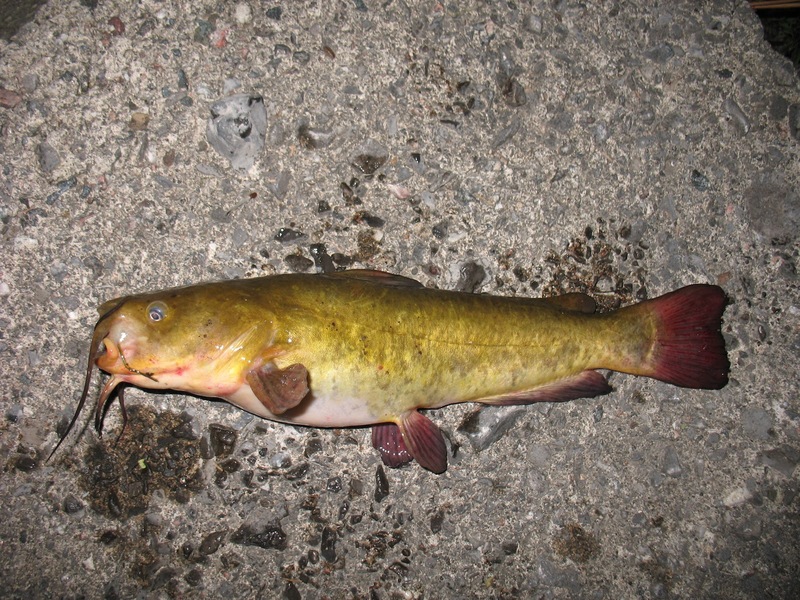 Since we were after channel catfish and remaining hopeful for the right kind of bycatch, we used whole nightcrawler to entice our whiskered friends. We used clip on bells to help signal bites in the darkness. In addition, we borrowed a couple of rod pod and bite alarm from Andrea for this event since we were prepared to fish three straight nights to accomplish our mystic goals. The loud alarms were our insurance policy in case we felt asleep at 4am and the mythical creature decided to bite. Fishing was fairly slow on Friday afternoon. I started the action with a medium perch. Michael bested me an hour later with our target Channel Catfish. Just as the light was fading, Michael was checking his rig when something felt like a snag during mid retrieve. The “snag” magically turned into a Silver Redhorse that didn’t fight much on Michael’s rig. Michael was beaming since this was his first Silver Redhorse. Once dark, we started to catch a few more channel catfish. Most were in the 1lb range and not very photogenic. While waiting for something bigger, Michael was reeling in his line to check bait when he noticed his rig was not coming in smoothly. Indeed, at the end of the line was the smallest Burbot I’ve ever seen. We did not expect to catch any Burbot here and it was a welcoming surprise for Michael as he checked off one more species! A little later, Michael had a small bite that turned into his first ever Walleye. Action was pretty lame for me since they were mostly small bites with the odd channel catfish. By 8pm, my friend Eli arrived and proceeded to put on a clinic. He set up on his favourite rock and quickly caught some better channel catfish in the 2-3lb range. At about 10pm, he had this knowing but relaxed stance as he held the rod in hand to sense a steady, vibrating bite. When the hook set finally came, the rod doubled over and a great fish surged. Somewhere in the darkness, we heard a sizeable breach as the fish identified itself. Yes…this is our target “bycatch”. Michael and I held our breath as the mythical creature soon came to colour in the shallows. I had the honour to tail this wonderful juvenile, being careful of the sharp scutes on the tail and back of this young specimen. Michael and I were hopeful about our prospect. Every strong bite we received appeared to be the “right kind”, but we were disappointed a few times when channel catfish revealed themselves. Eli, being the sturgeon whisperer that he is, hooked up to another mythical creature an hour later. This fish jump in the distance and we already knew it was bigger than the last fish. However, when the fish jumped close to shore and sounded like an air dropped cinder block, we knew this was no baby. Wow! This one is just about mature. We started pestering Eli for information. Were we missing some subtle technique in bait presentation? Were we fishing at the wrong depth? Should we aim for a certain structure in this large flow body of water? Apparently, Eli said it was just a random shot of luck. Somehow, after the entire weekend, Michael and I still cannot be convinced that it was dumb luck. At about 11:30pm, Eli had to leave. Michael and I stayed behind and got ready to settle in for the long night. We had a scattering number of hits where most were small channel catfish. It was not until 1am when Michael received a sizzling run and a confirming jump. Yes! Michael had accomplished a feat of mythical proportion! To be completely honest, I was a little jealous. Before this trip, Michael and I agreed that whoever caught the first sturgeon would relinquish all future bites to the unaccomplished angler, such that our cooperative fishing aimed to maximize our respective chance for each of us to catch this wonderful creature. Now it was all up to me to man two rods. A couple of times, slightly bigger channel catfish would get us excited. There were even ones that would thrash on the surface and had us fooled. We were planning to fish the entire night. However, rain and lightning soon spoiled our party and we had to pack and sat the storm out in the truck for an hour. Well, we took the opportunity to get an hour of shuteyes. Return back to the shore at 5am, we continued to catch a few channel catfish. Again, these larger channel cats had us hoping they were the right kind. Soon, the day broke and the bite slowed. 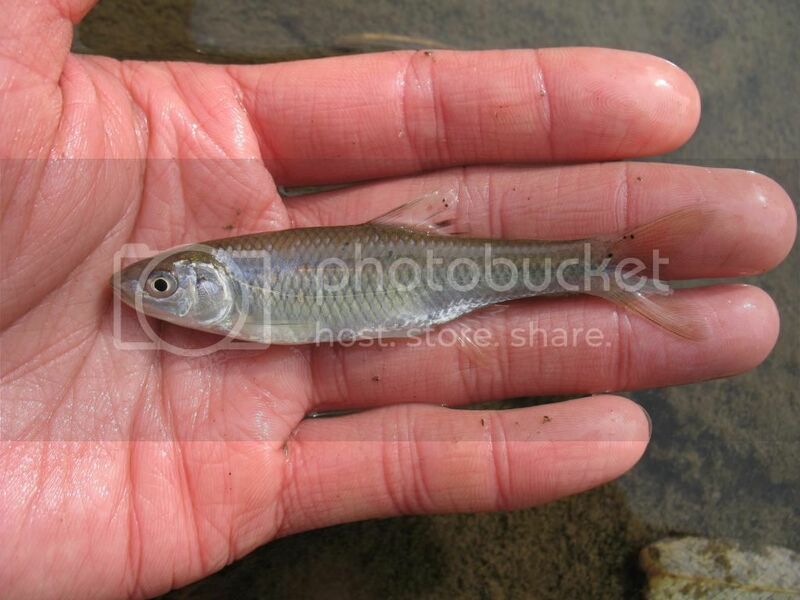 I did find a fine specimen of a Silver Redhorse that made me rather happy. This Silver Redhorse had an unwanted hitchhiker. I often say there are no ugly fish…but the Sea Lamprey quickly changed my mind. …but lips no one would want to kiss! By 8am, we had already been up for 26 hours except for the short hour nap. We decided to call it a “day” and crashed at Michael friend’s house. At 2pm, we woke up once again ready to fish. We explored some areas for a sauger but there were none to be found after 2 hours of fishing. The small Smallmouth Bass, a couple of big Rockbass and a couple of Pumpkinseed Sunfish kept us from getting bored, but we were yearning for more. Finally, we decided it was time to return to our magic land at 6pm. With our bellies filled, we set up once again with the understanding that all bites are mine. However, Michael did manage to add another new species to his list, one that even Eli in his 12 years of fishing had never seen in person out of this body of water. The Yellow Bullhead is the least numerous of the three bullhead species in the region. Encountering one is a rare event. This was turning into an even more mythical trip! I soon took every single hit including another wonder Silver Redhorse, among a few smattering of channel catfish. Eli once again arrived at 8pm. After setting up, we sat around chatting. Eli got up to look into the darkness as I stared skyward admiring the constellations. Our of the corner of my eye, I saw a bright streak descended and disappeared behind Eli’s head. “Yeah, a bright one too.” Eli confirmed. I swiveled my head toward the southern sky to wonder if I could find the origin of this celestial event. I just happened to look in the right direction when a second meteorite (or perhaps space junk) burned up brightly in the atmosphere. “Haha, I think I had an idea.” Michael chuckled. 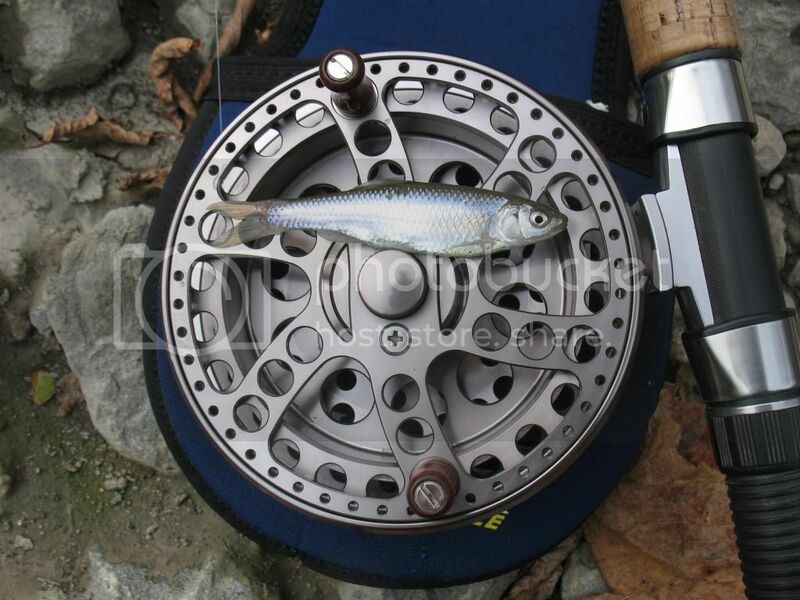 As soon as he finished his sentence, the bells on my rod shook with two violent rings and the bite alarm immediately beeped with a furious tone. The fish was already taking line out of the baitrunner on the hit. I grabbed the rod with lightning speed and the rod turned into a full arc. Woah! I felt three big thumping headshakes as the fish ran off on the first run. Before I could even control the fish, it had already run into Eli’s line to my right. We were both fishing with braid and this turned into the scariest fight I had in a long time. My nerves were a big mess as I tried to play the fish gingerly to avoid any extreme rubbing of our tangled braids. In the dark, it was difficult to determine which line was over and which line was under, especially when the intersecting point was way out far. As if this was not difficult enough, my easing of the fight allowed the fish to run into Michael’s line. Now we had 2 lines of 50lb braid crossed with a 30lb mono. My chance of landing this fish looked more bleak by the second. Fortunately, the gentle hand on the rod helped to bring the fish close to shore rather successfully. With the tangle within headlamp illumination range, Eli and I managed to free our respective line. Michael’s line was still crossed with mine, but at least now I had more control of the fish. We were still wondering if this was a big channel catfish at this point since the fish did not jump and I couldn’t really feel the fight as well with the tangled line. Eli grabbed the net and got ready. He soon sound excited when he had first to glimpse the shark like tail of the sturgeon. With a little bit of tricky maneuvering of two lines, we finally had the sturgeon in the purse. Truly, I am not a very superstitious person, and wishing upon a star was often done humourously. As if catching a Lake Sturgeon was not spectacular enough, I managed to “wish” up my first sturgeon with double shooting stars. This made the catch even more unbelievable as this magical circumstance was likely a once-in-a-lifetime, happily-ever-after fairy tale! 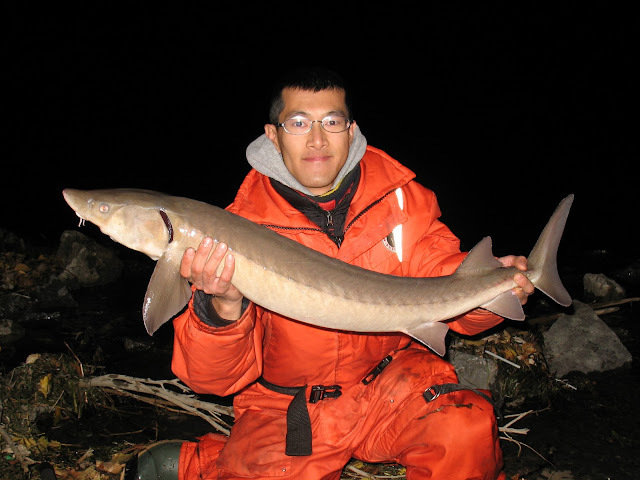 Stardust Sturgeon…my first Lake Sturgeon. (Acipenser fulvescens)…species #275 with a story to be told for a lifetime. I found out that the two meteors were part of the Orionid meteor shower. That's the first time I've seen meteors from this shower! I was so fulfilled after that everything else was just cherry on top. We caught a few more small channel catfish when Eli almost had a rod yanked into the river. These sturgeons were not shy at all! Again, Eli left at 10:30pm not long after catching his sturgeon. Michael and I stayed a little later until 2am for a few more channel catfish including this nice one by Michael, and I got a nice Brown Bullhead. The next morning, we picked up Eli at 10:30am to explore a river for River Redhorse. This is a species I’ve hunted for the last couple of years but yet to accomplish. The river looked primed and according to the fishery report, good number of them had been collected in the river in the spring and in the fall at this time of year. However, after a day of trying, we ended up with a measly perch for each person. I’ll have to return again next spring when the River Redhorse congregate in the shallow riffles for their procreating events. Eli had a dinner arrangement before he could join us for the last evening. Michael and I started early to find a very slow bite. In fact, we were pestered by small fish that proficiently nipped away our bait. If the small fish were not biting, it was likely crayfish that kept stripping our hooks bare. When Eli arrived, we only had a small walleye and two channel catfish to show for. The small fish were such a pest that Michael caught a rock bass that pulled the clicked and pulled drag. We all thought it was a decent size catfish on the hit. However, in true form, Eli came to show us just how it was done. A little under an hour after he arrived, Eli noticed that his line went slack and he tightened the line into yet another mythical creature. There is no way you can convince me that it was just dumb luck. Eli has to be doing something right! It was an exceptionally slow night. Perhaps the fish we well fed on Friday night and they were content. Even the ever-present catfish failed to keep us constant company. By 11am, Eli called it a night. Michael and I persisted until 2am hoping for one last sturgeon but it was just not to be. In truth, I had rather preferred it this way since my one and only Lake Sturgeon would put on more of an exclamation mark in my angling history. The only real exciting catch after Eli left was Michael’s second ever Burbot. Burbot often hug bottom and this one was infested by leeches. We tried to help the Burbot, but the leeches would not let go. Overall, the weekend of fishing was nothing short of fairy tale epic proportion. For such a difficult to find creature, Eli had this spot dialed in and we just happened to hit the conditions just right. Michael and I were both delighted that each of us had checked off the Lake Sturgeon with a respectable specimen and I was even happier that Michael managed to catch 4 extra new species. We caught enough Channel Catfish to feel several families, but we decided to release all of them. They were truly fun to fish for, but for a total cost of under $100 for the weekend, there is nothing remotely close I would trade for such an experience for that price.